Cabinet Minister, Yeo Cheow Tong, fired!!! And fired from parliament, and thrown out of the PAP!!! We did it!!! With our reader's help!!! Thanks!!! The bum is gone forever!!! Escape from Paradise has never been banned in Singapore. The books problems were created by the malicious actions of Helen Yeo and Yeo Cheow Tong. Here is the letter from Singapore's Media Development Authority (MDA) proving that Escape from Paradise was never banned in Singapore. We send our sincere thanks to MDA for this clarification. Were Yeo Cheow Tong and his wife, Helen Yeo, in debt for millions - facing bankruptcy? Did the Singapore government pay Yeo Cheow Tong his retirement as a lump sum so he could get out of debt? Is it true about Helen's sister, and the missing US$350,000 from the covert intelligence post in Cambodia? Ask Mr Lek Siang Pheng of Helen's firm Rodyk, email: lek.siangpheng@rodyk.com. Is Helen Yeo being booted out of Rodyk by the "Indian mafia." moves to Afghanistan - from one narco-state to another. Helen Yeo is booted out of Rodyk! Helen's karki, Philip Jeyaretnam, has taken over Rodyk. (However, he has that link to alleged Tamil terrorist Baldev Naidu, the political partner of his brother, Kenneth Jeyaretnam. Philip Jeyaretnam has stated, "There are a number of things which Helen has built for the firm and which I would plan to continue, these include Rodyk's ... regional strategy - which includes China, Indonesia and to a lesser extent India." Hey what about her fake office in Myanmar, Dan di Mirmont's work in Morocco, and Afghanistan? Then there is the Tamil Terrorist branch with Philip's brotherm Kenneth, and Kenneth's partner Baldev Naidu, currently in a US jail awaiting trial on terrorism charges. Helen Yeo with her new Sarah Palin look! Order now as you can receive it in Singapore safely by mail! "Strangely, I understand why there aren't many reviews posted here, especially by Singaporeans. For fear of being on the wrong side with the government I presume. I love this book, completed it in a day!" Purchasers of Escape from Paradise include Singapore Chief Justice Yong Pung How and Daim Zainuddin, Malaysia's former Minister of Finance. her fake office (covert spy operation?) in a Myanmar dress shop, run by sister, Juliana Tan. 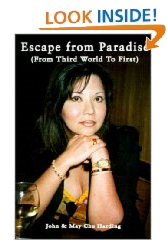 Helen Yeo's law firm, Rodyk, overcharged the author of Escape from Paradise -- who sued and won back S$31,359.53 from Rodyk -- read about it in Escape from Paradise - or see Rodyk's admission of guilt here - Click! Is this why you banned our book, Helen? Helen Yeo also threatened to sue the authors over Escape from Paradise - she never did. No one, especially not Helen Yeo, has dared challenge anything in Escape from Paradise or on this website. This IRAS property tax document shows why. Two semi-detached houses were sold on same contract with different IRAS recording dates!!! We believe this was done so that bankrupt Jackie Lee Teng Jin, grandson of Tiger Balm King Aw Boon Par, could escape with his money while during his divorce -- which he did. Why did Ng Boon Gay, of the Singapore Police, fail to act? Two of Helen Yeo's lawyers were the original shareholders of Goldplus Investments, the company which purchased the 69 Holland Road property. This is the only property in which Goldplus is involved. So Goldplus was set up by Helen Yeo only for the Holland Road property, now Holland Mews. We sued Helen Yeo in the Unitied States Federal Court (case #CIV-02-1417-PHX-JAT), but she never appeared - see our formal complaint. We sued Helen Yeo's firm, Rodyk & Davidson, for overcharging on another matter, and won. Helen Yeo didn't want our readers to see, her firm, Rodyk & Davidson, exposed by Escape from Paradise. Click! Helen's Client, Indonesian fugitive, Liem Tek Siong, alias Sjamsul Nursalim, alias Liem Tjoen Ho, whose family owns Habitat, and bought Goldplus, which had just purchased 69 Holland Road, now called Holland Mews. Why wasn't Holland Mews ready for occupancy until 2005? Could this delay have anything to do with the Statute of Limitations? What developer lets a property stand vacant for 10 years (Goldplus purchase was in 1995). This guy has been named as Honorary Consul to Ghana! Guilty of insider trading in the US, and fined US$2.25 million by the United States. Plus four dead due to Nicoll Highway collapse. Yeo Cheow Tong's LTA Blames Nishimatsu-Lum Chang (NLC) for the Nicoll Highway collapse. NLC is defended by Rodyk, the law firm of Yeo's wife, Helen Yeo. It was Yeo Cheow Tong (LTA) vs wife Helen Yeo (NLC). What a money-making opportunity for the Yeos! Jackie Lee Teng Jin, missing from Singapore from 1995, when he sold 69 Holland Road to Goldplus. There was a Warrant out for his arrest, while a Caveat was in effect against the sale, and the IRAS registered the property as being sold 6 months prior to the sale. Corruption or incompetence on the part Singapore's tax authority? You choose. A missing person for Lee Teng Jin was filed in 1996 with Officer David Wong, Singapore Police did nothing until July 2005. Finally, under pressure from this website, and emails, they revealed that Lee Teng Jin returned to Singapore! After appearing in Singapore Family Court he has rejoined his divorced wife -- a wiser and a poorer man! Escape from Paradise is not about Helen Yeo, it is a personal story, from the early days of the Tiger Balm Kings to the present. This one is hot from my banker friends. 3) The same happened in the past when Far East nearly went under few years back. The government forced all banks to not pull the plug due to huge exposure of government projects via Far East and the government was trying to return the favour. That's why Kwek Lian Beng very tulan...the special treatment Ng Teng Fong gets. 4) PAP knowing that a Bankrupt Scandal will cause chaos and tarnish the PAP branding & party integrity had decided to issue Yeo Cheow Tong a one time payment to help pay all outstanding to the banks. It is in the range of tens of millions and in return, he would be asked to step down. A friend shared with me that her father Mr. Chen, an entrepreneur, was almost bankrupted in one incident sometime in the early 1990s because of Helen Yeo’s dirty job. Helen Yeo, a lawyer, is the wife of ex transport minister, Mr. Yeo Cheow Tong. Mr. Lim, a partner of Mr Chen, engaged Helen Yeo who helped him make a false police report about the way Mr. Chen and his wife cheated him and the government of tax. The Police then convinced the CAD to raid Mr. Chen’s and his wife’s business premises one day after the police report was made, and took all their business records for an almost 6 months of investigation. Mr. Chen’s business came to a standstill for 6 months without the revenue to pay for the monthly overhead expenses and advertising cost incurred. Mr. Lim was earlier dismissed by the board after having been found to have secretly registered two companies under his brothers’ names and using them to solicit business from the company’s long-term clients. With his brothers’ help he also stole raw materials from the factory to produce product samples to send to the company’s clients and promising the clients that he could sell them at 30% less if they buy from his new companies instead of from the original company. Although Mr. Chen had also lodged a Police report of Mr. Lim’s raw materials theft case, the police, instead of carrying out a discreet investigation on Mr. Lim after evidences were shown to the police, the I/O called Mr. Lim and told him of Mr. Chen’s report and gave Mr. Lim time to produce evidences that he did not steal the raw materials. A week or so later, the I/O told Mr. Chen that Mr. Lim did show him his receipts of the raw materials purchase. Mr. Chen protested and showed further evidences that the receipt from Mr. Lim were dated later than the product samples he sent to the company’s long-term clients, thus the raw materials used to make those samples couldn’t be from his own purchase. A stock inventory made also found a huge amount of raw materials under Mr. Lim’s brother’s charge missing. Despite all these evidences produced to the I/O he insisted on dismissing the case. Was the I/O bribed??? Mr. Chen’s lawyer also discovered that the CAD had acted on the false police report that was sent to them by Mr. Lim just a day before the CAD’s raid. Mr. Chen wrote to all 77 PAP MPs (and ministers) to complain and to ask for an investigation as to why Helen Yeo has such power to summon the police and the CAD to act so swiftly as if it’s a terrorist or life and death case. During the pre-trial conference and the trial, Helen Yeo’s young lawyer dared even called Mr. Chen’s lawyer names, and the presiding judge did not object! Why was the police force so obedient to Helen Yeo? and the CAD so obedient to the police? It was as if Helen Yeo owns the Police Force and the CAD! Even the judge was biased! Despite that the CAD was informed with evidences that Mr. Lim was the company director, overseeing and in charge of finance, purchasing, marketing and the business entity operated by Mr. Chen’s wife, with another two of Mr. Lim’s brothers working in the factory, and that as such, Mr Lim’s claims that Mr. Chen and his wife’s hanky panky accounting to cheat him and the government could not hold water, the CAD insisted to press on charges. In the end, Mr. Chen’s wife was persuaded to plead guilty on the lawyer’s advice in order to save the running legal fees as CAD had the right to drag the law suit until they win because of face-saving, convincing Mr Chen and his wife that it was just like a traffic summon. The CAD could not have a case against Mr. Chen. According to Mr. Chen, he wrote twice to all 77 PAP MPs and ministers but he received no response at all. In later years, Mr. Chen also spoke to one of the Straits Times editors and requested him to have the story of his plight published, but it was declined. Mr. Chen is prepared to present himself again to help with the investigation if the Police and the CAD is prepared to dig up the dirt. If they are not, would our righteous PAP government press on the Police and the CAD to investigate this matter? If someone in Helen Yeo’s law firm, or in the Police force or the CAD were doing Mr. Lim and/or Helen Yeo a big favor whether for personal gain or friendship, it is only fair to Mr. Chen and his wife that this person or persons be prosecuted. Moreover, if someone who was in charge of filtering letters received for the PAP MPs and ministers he/she too must be probed into, as to why this was not brought up to the minister in charge, or the minister in charge also did a favor to Helen Yeo (Yeo Cheow Tong’s wife) to help them cover up? After knowing what Helen Yeo has done as mentioned in that book, ‘Escape from Paradise’ there must be something not right with our judiciary system. I think the people is also interested to know how could this happen in Singapore’s first world government. Those involved must pay the price! This photo was taken back in 2000 at the address Helen Yeo claimed to be her Burma office. Are these "lawyers" now working for Rodyk & Davidson? How much do they charge for a one hour "session" -- Geylang rates? Is the reflected face under the arrow that of Madam Helen Yeo? Since Dan de Mirmont has moved to another narco-state, Afghanistan, www.mirmont.com has been abandoned. Does Singapore Chief Justice Yong Pung How ever check on such things? Helen's Yangon dress shop senior "partners,"
But does Juliana know about her "partner" Dan's romantic letter to that "other woman," Miriam W...? Referring to 67 and 69 Holland Road, we wrote the IRAS, "Since these properties were transferred at the same time, it is strange that the records for the two properties are different." Why did Ms. Lee Leng Kiong, IRAS Director of Corporate Communications, take it on her own time after working hours on 22 Nov 2002 to send us a personal email with misinformation, stating "The IRAS Valuation List is a record of the person responsible for the payment of property tax for a property." Was she trying to keep us from speaking to TODAY, the Singapore newspaper that was publishing a story on the matter? Is Ms. Lee Leng Kiong related to Mr. Lee Leng Kiong of MediaCorp, TODAY's publisher? Did he tell her that the article was being written? We answered Mrs. Lee, citing our proof at the IRAS webpage: http://www.iras.gov.sg/Services/svcValuationList.htm. Then the IRAS removed the webpage! "In the car, May Chu kept her fingers tightly on the steering wheel...I simply could not accept emotionally the fact that I could be experiencing a relapse." 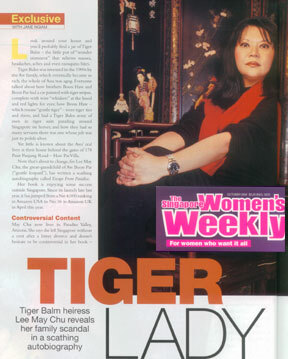 is featured in the October 2002 issue of The Singapore Women's Weekly. Was it to protect the two fugitives and cover up a million dollar fraud? Escape from Paradise, was banned in Singapore by Helen Yeo, a lawyer, and, more importantly, the wife of Singapore Cabinet Minister Yeo Cheow Tong. She threatened to sue any book-seller who sold Escape from Paradise for defamation. Escape from Paradise was removed from circulation, even though it was the most popular book in Singapore's National Library with all 25 copies usually checked out. The banning of Escape from Paradise is mentioned in the Library Journal. The book is not defamatory. It does however allude to the sale by missing fugitive Jackie Lee Teng Jin of his multi-million dollar house to Goldplus, a corporation set up by Helen Yeo's law firm for Habitat (owned the by family of Indonesian fugitive, Liem Tek Siong, aka Sjamsul Nursalim). Although not mentioned in the book, Singapore's Valuation List (13 June 1995) shows the property as being owned by Goldplus six months prior to the transfer date (26 December 1995) given by Helen Yeo in her letter to the authors. In addition there was a Caveat issued on 19 April 1995, against the sale of the property, and a Warrant issued for the arrest of Jackie Lee Teng Jin on 29 April 1995. Through her threats to Singapore's Kinokuniya Books, Helen Yeo, former head of now defunct Singapore law firm HelenYeo & Partners, and wife of Singapore Cabinet Minister Yeo Cheow Tong, attacked us, blocking the sale of Escape from Paradise in Singapore. She had no court order and no legal basis for her action. Our book was banned by the whim of an individual, not by Singapore, and not by the law! It took us months to find out that Helen Yeo was responsible. Our guess is that she lacked the courage and decency to contact us directly with her concerns. Helen finally wrote us,"In view of your recent offensive actions, we will take action against all persons in Singapore who continue to publish or distribute the defamation originating from you." There is nothing in the book which is untrue or which defames Helen Yeo in any way. No action taken by Helen Yeo is even mentioned in the book. The book is not about Helen Yeo; it's a better book than that. There is nothing in Escape from Paradise to implicate Helen Yeo?unless we stumbled upon the scene of a crime without knowing it. Did we, Helen? Was there fraud involved in the Goldplus purchase 69 & 67 Holland Road? We don't know. We don't think the Singapore government can possibly be happy about the adverse publicity Helen Yeo is generating for her countryand there is more on the way. Our commercially reasonable expectation of selling our book in Singapore has been totally damaged by Helen Yeo’s extra-legal (illegal?) action. Escape from Paradise is backed up with 20 file boxes of documentation and tape recordings. In her threatening letter to us of July 8, 2002, Helen Yeo has admitted that her firm incorporated Goldplus, the firm related to the false recording date for the sale of a property mentioned in the booksomething we knew nothing about when we wrote the book. Helen, for what purpose did your firm set up Goldplus? There must have been a reason. Why hasn't Helen Yeo answered our letter in response to her letter of July 8, 2002? The Chief Justice of Singapore (who ordered Escape from Paradise) has not attacked us. Dan Arnold, ex-CIA Chief of Station in Thailand, and friend of Bush has not complained. Alexander Irvine, the United Kingdom's Lord Chancellor, has not complained, neither has Brunei's Prince Jefri or Brunei's Minister of Home Affairs Pehin Isa. Several members of Singapore Senior Minister Lee Kuan Yew's family have read the book. Only Helen Yeo has objected. The excerpt from the book referring to Helen Yeo's law firm can be found by clicking on "Singapore Justice," on the sidebar. Helen Yeo's "Fame" Spreads to America! The article appeared in the New York Bar Association publication, New York Lawyer on July 24, entitled, Orrick Ally Ignites Book Flap. Helen Yeo has generated some very bad publicity for herself. "Helen Yeo, whose firm has a joint venture with Orrick, Herrington & Sutcliffe in Singapore, objects to a passage about Helen Yeo & Partners in the memoir "Escape from Paradise: From Third World to First." The authors claim she threatened to sue a Singapore bookstore for defamation if it continued to sell the book. Kinokuniya Book Stores responded, they say, by pulling the book off its shelves. Asked about the allegation, the head of Kinokuniya's corporate relations department said store managers "do not wish to comment. Yeo did not return phone calls and an e-mail message; Baxter was on vacation and unavailable for comment last week. Yeo's firm is mentioned in a passage about a property sale by May Chu's father." The original 25 copies of Escape from Paradise have now been removed from Singapore's National Library, except for one copy which remains "For Restricted Use Only ." This banning of Escape from Paradise is mentioned in the Library Journal. All copies of Escape from Paradise were in continuous circulation until Helen Yeo attacked our book. This fact which was brought to our attention by a reader in Singapore, who wrote: "...I have a friend who is quite high up in National Library. He has verified your version of events about the book being taken out and with a single copy remaining. However, he said that NLB tried to challenge Helen Yeo's request, but this was put down by someone." Now who could that have been, Helen's husband, Yeo Cheow Tong? The NLB 's statement is false. Usually all of the 25 copies at NLB were checked out, and with a paid waiting list. According to the records, Escape from Paradise was the NLB's most popular book. The University of Malaya Cooperative Bookshop has ordered Escape from Paradise, and our book is available at The British Library in London, the Ohio University Library, and the Cleveland Public Library (among others) while Helen keeps Singapore in the DARK AGES. Lee Teng Jin was under duress when he set out to sell the Holland Road properties. His wife had filed for divorce, and the Court had lodged a Caveat against the sale of the property. Solicitors for Lee Teng Jin's wife obtained an Order-of-Court on April 19, 1995, restrained him from "disposing of or dealing in his assets including his interests or share in the sale proceeds arising from the sale of of the matrimonial property know as 69 Holland Road." The petition to declare Lee Teng Jin bankrupt was filed on April 4, 1996, he was adjudicated a bankrupt on June 7, 1996. Lee Teng Jin's Bankruptcy Number is B486/1996. If the undervalue transaction involving the bankrupt's properties within five (5) years of the presentation the transaction may be avoided at the instance of the Official Assignee. If there is an undue preference, that is a sale, disposition, payment or a transaction that gives preference to an associate of the bankrupt within two years of the presentation of the Bankrupt Petition, it may also be avoided. An associate includes a company which is controlled by the bankrupt, or by his associates. "AS AN undischarged bankrupt, Choong Kian Haw, 48, was not supposed to leave the country without the Official Assignee's (OA) permission. But he did so 44 times between Oct 11, 2000, and Jan 10 this year. Yesterday, he learnt he was no longer going anywhere as he received a six-month jail sentence. " So how did Lee Teng Jin sell his S$9,820,000 Holland Road property in the face of a Caveat, and escape as a bankrupt from Singapore with a Warrant out for his arrest? We allege that, because of the Caveat, and Lee Teng Jin's bankruptcy, the 69 & 67 Holland Road sales to Goldplus must be voided to pay of Lee Teng Jin's creditors, as it was both an undervalue transaction and undue preference was given to the purchasers (Goldplus shareholders). We have been contacted by Foo Say Pheng, Senior Officer, of the Insolvency & Public Trustees Office regarding this matter. and we have evidence that he was instrumental in contacting the bookstores on her behalf! Helen Yeo Passed Over for position as Senior Counsel! But does Jeyaretnam want to work out of a Yangon (Rangoon) dress shop with ex-Filipino beer salesman, Dan de Mirmont? Can pigs fly? Chief Justice Yong Pung How apparently gives his blessing to Helen's dress shop office by promoting Helen's fellow Rodyk lawyer, Philip Jeyaretnam (above) to the rank of Senior Counsel (equivalent to that of an British Queen's Counsel). Helen Yeo didn't make the grade. Her Yangon office ran out of a dress shop partnered by ex-Filipino beer salesman, Dan de Mirmont. And that's OK with Yong Pung How? Liem Tek Siong and Jackie Lee Teng Jin. The misleading date on the IRAS Valuation List. The bad publicity generated by her extra-legal banning of Escape from Paradise.Click! Helen Yeo's letter to us of July 8th, 2002 threatening to sue for defamation was copied to only one personPhilip Jeyaretnam. Coincidently, Philip Jeyaretnam is (or was) on Singapore's Censorship Review Committee. Was he therefore responsible for the removal of our book from Singapore's National Library? Is that why Helen copied him on her letter to us? Was Jeyaretnam the lawyer who threatened Kinokuniya Singapore on Helen's behalf to ban Escape from Paradise? Philip Jeyaretnam is the son of JB Jeyaretnam, an unsuccessful but harmless Singapore opposition politician, who himself has been destroyed and bankrupted by Singapore's famous defamation lawsuits. The son, Philip Jeyaretnam, now serves the same masters who destroyed his father. Philip Jeyaretnam has now been elevated to the rank of Senior Counsel by Singapore's Chief Justice Yong Pung How, the same judge who bankrupted his father. This was certainly not an award for filial peity! Philip Jeyaretnam has written a semi-autobiographical novella, Abraham's Promise, which can be found at the Asian Gay & Lesbian site, below. We are not against alternate lifestyles, as is Singapore, but we find it ironic that Baby Jeya should become an Ah Qua cultural icon. No wonder brother Kenneth Jeyaretnam wants nothing to do with Philip. Click on the image to visit (if you are over 18). now what have you done! July 2002: Helen "bans" Escape from Paradise, by threatening Singapore's leading bookstore, Kinokuniya, with a law suit if they did not remove Escape from Paradise from their shelves, as she "objected" to its chapter, The Scam of 69 Holland Road. July 2002: We uncover Helen's motive for threatening to sue usthe rapid property transfer between two fugitives along with the bogus IRAS registration date. Aug. 2002: Helen's husband, Singapore Cabinet Minister Yeo Cheow Tong, misuses the prestige of his position by having Escape from Paradise removed from Singapore's National Library. Nov. 2002: Helen loses her law firm, as it "merges" with another firm. Nov. 2002: Singapore's tax authority, the IRAS defends its part in the property transfer by sending us misleading emails, and removing its "incriminating" web page! Click! Nov. 2002: We discover Helen's purported Rangoon law office is run out of a dress shop. Dec. 2002: Yeo Cheow Tong is expelled from Singapore's ruling People's Action Party (PAP) all powerful Central Executive Committee. Jan. 2003: Helen loses her joint venture partnership with Orrick, Herrington & Sutcliffe, her U. S. joint venture partner. Too shameful for the news to report until The Business Times breaks the news on April 1, 2003. Apr. 2003: Singapore Cabinet shuffle marks the end of Yeo Cheow Tong's career. May 2005: Singapore news blackout of Helen Yeo continues. July 2005: Yeo Cheow Tong makes media comeback. Aspires to become Deputy Prime Minister - following attack on former Prime Minister, Goh Chok Tong, over National Kidney Foundation scandal. May 2006: Helen Yeo's husband, Yeo Cheow Tong, fired as Singapore Minister of Transport, over alleged financial difficulties. June 2007 (circa): Yeo Cheow Tong hired as glorified office boy by shady Indonesian Riady family. Yeo's pay? A reported S$22,000 per month, less than 1/5th of his government salary. 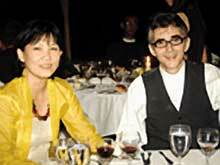 January 2011: Helen Yeo no longer managing partner of Rodyk! She's out! Helen Yeo banned Escape from Paradise over the "Scandal of 69 Holland Road," now the Holland Mews condo project. Initially, only 5 units were optioned. So now they had to "relaunch." Who bought these units, years before they will be ready on March 30, 2006? We don't find them Singapore's Valuation List. A mini-HPL? The occupancy date is over ten years after the property was purchased by Goldplus (incorporated by Helen Yeo). How can you make money keeping a property vacant for ten years? You cannot! Does IRAS care? Apparently not. Is Helen's associate, Michael Henry Winton the same person allegedly involved with forgery in the death of five Australian journalists in Indonesia?